Keeping it simple! You simply exchange heat. You don't cool air, you either add or remove heat. Did you know that the ground beneath our feet maintains a constant temperature below 30 feet? A geothermal loop design uses ground source heating and cooling by moving water through a series of loops. Those loops take advantage of the constant ground temperature to change the temperature of the water in the loops. That water is used in conjunction with your "HVAC heat pump" to deliver baseline temperatures. From that point the HVAC system can condition your room temperature using less electricity or gas. 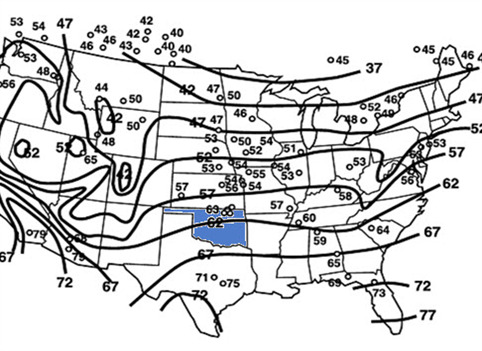 In Oklahoma the ground source temperature below 30 feet is between 62 and 69 degrees. We work closely with your HVAC Contractor to assure optimum operation of your Geothermal Heating and Cooling System.